Since entering the NHL in 1974 the Washington Capitals have seen their share of ups and downs. Though they have seen success during the regular season, as of late the playoffs have been a hard time for the Caps in terms of finding a hero willing to step up in the most gut check time of the season. Besides their magical run to the Stanley Cup Finals in 1998, one of the most significant playoff memories in franchise history is the scoring clinic put on by forward John Druce during the 1990 Stanley Cup playoffs. Heading into the post season Druce had only 8 goals in 45 regular season games, but exploded in the playoffs scoring 14 times in 15 games. At the time, his outburst put him in a tie for third all-time for goals scored in a single playoff series with nine. Druce would go on to play in 531 NHL games and officially retired from professional hockey in 2000. He would continue to be involved in the game as a hockey analyst with Sportsnet until 2004, when he left to be with his daughter who was diagnosed with leukemia. This unfortunate turn of events inspired John to join her in her battle to fight the disease, which affects millions of people. In January 2005, Druce, alongside members of the Peterborough Police Department worked together in association with Cops for Cancer to start Pedal For Hope in benefit of the Canadian Cancer Society. “The concept of Pedal For Hope is that we ride through and visit 50 schools every spring for just over a three weeks. We go into the schools and do an hour-long presentation and we show a DVD, which includes many celebrities such as Ron McLean, Don Cherry, Carrie Underwood, Mike Fisher, Jason Spezza, and many others,” said Druce. “We talk about why we’re there and what our goals are. We have ice cream eating contests, put skits on for the kids, get them involved by participating in different things and the kids really enjoy it and from what I hear it’s the highlight of the year when we come into the schools,” he elucidated. “Usually we’ll do 3-4 schools a day. We’ll ride to the schools we go to everyday then we’ll load up our trailer, drive home, and then start the next day where we left off so we don’t miss any kilometers,” continued the Peterborough, Ontario native. The Pedal for Hope project is supported by so many people in the Peterborough community and with the help of sponsors, such as Shimano Canada who constantly donates various bike components and connects the riders with essential equipment; Druce and the police officers involved are able to achieve their goals year after year. They also include those in the community who are battling cancer to join the riders as they conclude their mission and celebrate the progress made each year. “There are about 30-35 kids in the area that are what we call ‘friends whom we ride for’. I ride for my daughter and another young fellow named Jack Prins. At the end of every year on the last day of our ride we join up with all the kids and ride with them for the last kilometer to our final spot. Canadian Tire has also been so gracious to donate bikes to the kids who may not have one which is an added bonus,” said John. “It’s kind of like a grand finale for the ride. Unfortunately we’ve lost some kids, but thankfully the research that’s going on now has really worked and there’s a larger chance for kids to survive,” he added. 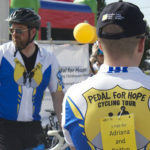 It is beyond clear that Pedal for Hope has made a positive and noticeable impact on the Peterborough community and for cancer patients nationwide. For that, their selfless work has not gone unnoticed as they have received numerous honours and notable mentions, including a visit to Parliament Hill where Prime Minister Stephen Harper honoured them. Druce alone has also received acknowledgement as he was made an Honourary Police officer by the city of Peterborough. “It’s an honorary position so I don’t have a badge or anything like that but I guess a couple of the team members went to the Chief in Peterborough and said I was one of them. I think it has only been done one other time in Ontario, I didn’t even know they did that,” says Druce. “It was really a shock for me, but such an honour. We’ve also been honoured by the OPP and various other organizations. The support has been overwhelming from everybody,” Druce proceeded. Washington Capitals fans will always remember John Druce as a playoff hero who stepped up and provided hope for a team who had lost their highest goal scorer. To the people of Peterborough and for the millions who suffer from cancer he is a hero who has stepped up and provided hope for those who have lost hope in their own lives. For many, he and the men who cycle every spring are regarded as guardian angels, role models and inspiration that if we continue to work together we WILL beat cancer. John’s daughter, who was diagnosed with leukemia eight years ago, is now healthy and living her normal life. “My daughter’s doing great. She’s been in remission for four years now. She went through cancer three times so she went through her treatment the first time. She had chemo and went through remission for two years, then relapsed and had a bone marrow transplant and was in remission for two years, and then relapsed again, and then had another bone marrow transplant and she’s been four years clean now,” explained Druce.